Modi’in Cemetery, Israel The bodies of Eyal Yifrah, 19, from Elad; Gilad Sha’ar, 16, from Talmon; and Naftali Frenkel, also 16, from Nof Ayalon - who were murdered nearly three weeks ago by terrorists after being abducted on their way home from school - were laid to rest side by side this afternoon in Modi’in cemetery. 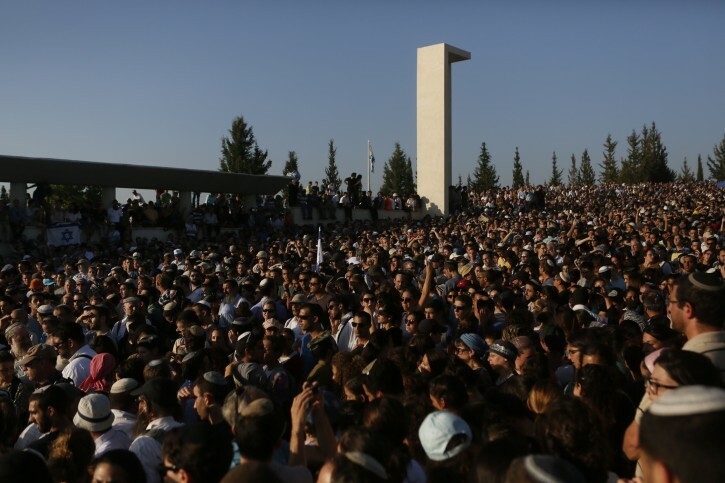 Tens of thousands took part at the funeral ceremony that began at roughly 6:40 p.m., with slightly over an hour delay apparently due to Prime Minister Binyamin Netanyahu’s late arrival amid the complicated arrangements of coordinating the thousands of participants. 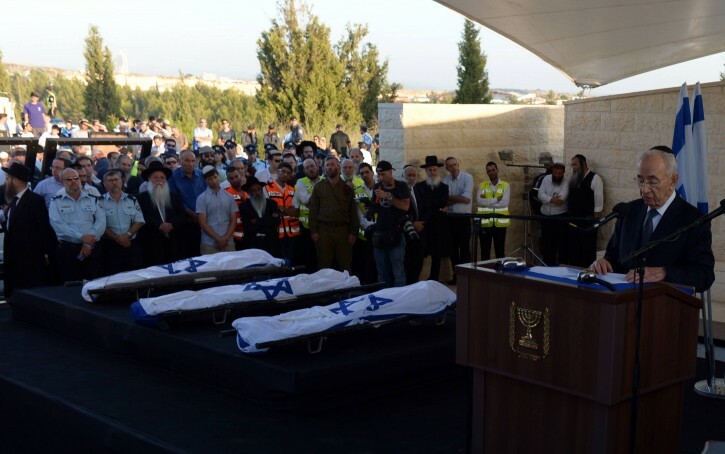 The three bodies, wrapped in Israeli flags, were laid beside the podium. At the start of the ceremony, the fathers of the three murdered teens recited kaddish (the prayer for the dead) together, facing the flag-draped bodies of their sons. Rabbi Dov Zinger, Dean of Yeshiva Makor Chaim in Kfar Etzion where Naftali and Gilad studied, and where the teens were returning from when they were abducted and murdered, spoke next. “You were abducted at the start, the very start of your lives,” said the rabbi, describing the boys and their personalities. 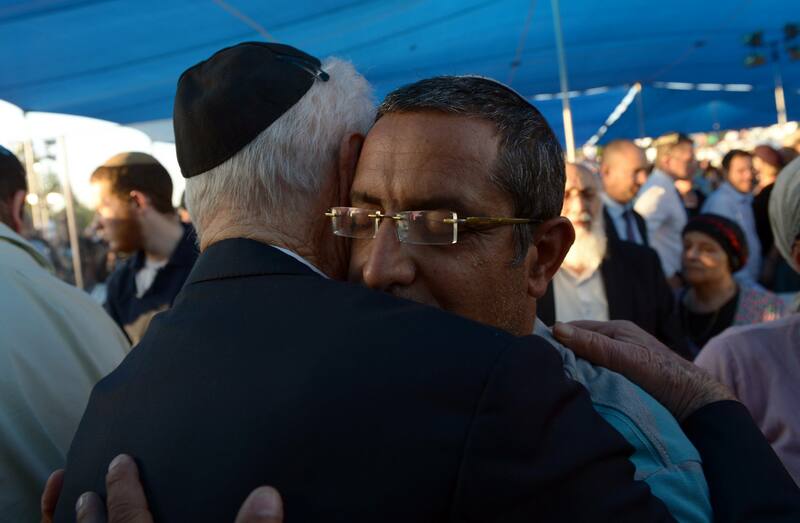 Addressing the families, the rabbi commented “you opened your hearts and your doors to us in recent days,” noting how through bringing all of Israel together in sorrow - from across the religious and political spectrum - they succeeded in unifying the nation. “Let us remember that saying ‘two Jews, three opinions’ - but one heart,” remarked Rabbi Zinger. A visibly emotional Prime Minister Binyamin Netanyahu then took to the podium. 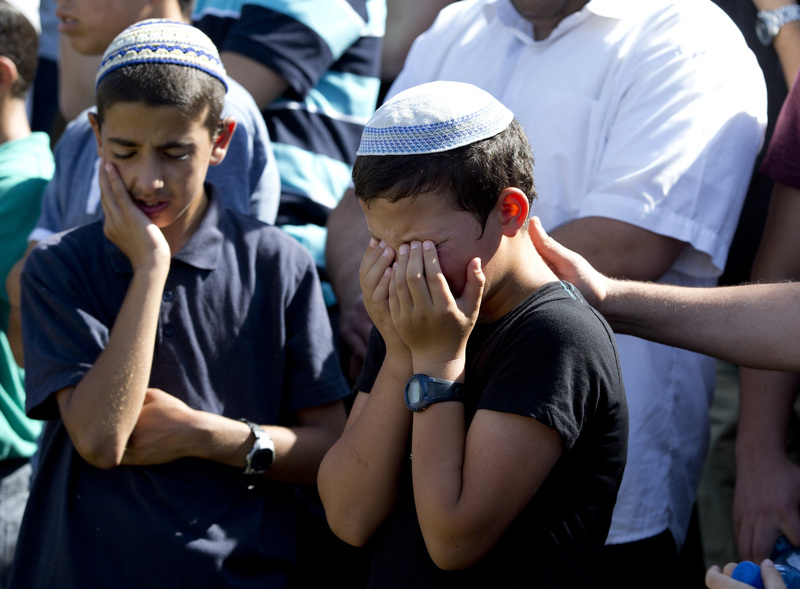 “In the last 18 days the figures of Eyal, Gilad and Naftali were carved on our hearts. ...This day spontaneously became a national day of mourning. “The whole nation prayed for the return of the boys, and the whole nation saw the nobility of spirit, and inner strength of you, the parents,” added the prime minister. Addressing the mothers Racheli, Bat-Galim and Iris, Netanyahu remarked “you gave the whole world a lesson about the cry of a mother,” likely referencing their speech at the UN. “These are despicable murderers of children, whose brothers rejoice over the spilled blood of the innocent. A deep moral abyss separates between us and our enemies. They sanctify death, we sanctify life. They sanctify cruelty, and we sanctify mercy. That’s the secret to our strength, and also the basis for our unity,” noted Netanyahu. Jerusalem Post/AP/Arutz 7 contributed to this report. President Shimon Peres in his farewell to Gil-Ad Shaer, Eyal Yifrah and Naftali Fraenkel said, “We prayed for a miracle, unfortunately a tragedy occurred,”. “We will strike with a strong hand until terror is eradicated at the root,” Peres vowed. “Terrorism is a boomerang,” the president added, saying that acts of terror such as the kidnapping are directed at Israel, but do more harm to those who carry out the acts. The Flags instead of Taleisim are very absurd. Zionists until the end?? May G-d protect our people and avenge or enemies. At a time like this???????????????????????????????? You are some piece of work. Hashem Yerachaim. Liar, you don't want any Jews to live ANYWHERE in Israel, now back to the woodwork to you. Do you know how many Jews have died for that flag? When the Jewish Fighting Organization rose up in Warsaw what flag do you think they raised above the Nazis? When the Jews fought to defend then land from invading hoards in 1948 what flag did they raise? And BTW, how do you know if there was not a tallit below the flag? And what was the condition of the niftar? Serve in the army and or in a chevrah kaddisha before you share your cynical and inappropriate comments. The nazis didn't even let them keep their Tallaisim! Wrong of you to make this insensitive comment. You know why? It will come to you in a dream tonite. Why do you ridicule people who find comfort in the observance of halacha? We are used to seeing the tallis it reminds us that Hashem runs the world, not men. We find comfort in the observance of our minhagim and our rituals. I am also upset by not seeing the tallis. It reminds me that just as there are tragedies and times of great sorrow there will also again be G-d willing better times of joy and simcha. 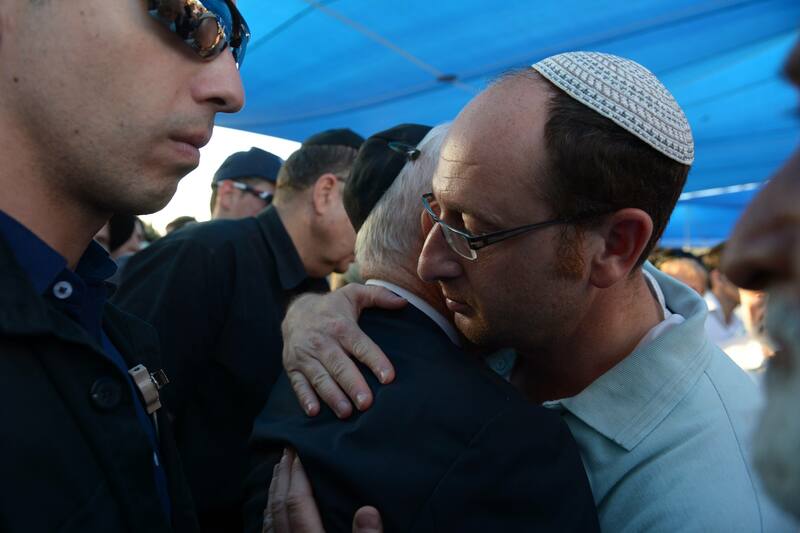 B"DE May Hashem comfort the families among the mourners of Zion. Hashem Yikom Et Damam. The tikkun, - if we can dare to say that in the context of such savagery- is what we experienced as KLAL YISROEL these past 18 days. All Jews put aside their differences (Chareidi, Daati Leumi, Ashkanazi, Sphardi, Chiloni) to focus on three innocent and carefree Yeshiva students. The message and the Tikkun from this horrific tragedy is that all of us Jews- no matter our background- can come together in any situation in a non-judgmental & open hear-ted manner AND unity & love will ensue...despite the outcome of the gathering or the goal of the movement.. THAT IS THE MESSAGE WE MUST BE SPREADING. Hashem will take care of our enemies at a time he sees fit. Being non judgmental and praying from our hearts...that is our our Tikkun...lets do it!!!! “ Why do you ridicule people who find comfort in the observance of halacha? If you want to see tallitot go to shul. When we go to funerals in the US you never see a tallit, the aron is closed and we assume (correctly) that the chevrah has prepared the niftar k'halach v'k'minhag. The boys were all covered in a talis, and the flag was over the tallis. If you would listen to the hesped given by the father of one boy who said "All I was yearning for was to cover you by Birchas kohanim one more time, and now your holy body is covered with my tallis". Furthermore, according to the rama in Y"D there is a minhag not to cover at all with a talis in accordance with what is nifsak in the Yerushalmi in the name of Aba Shaul. Maybe #1 is not as smart as you. But you , who considers yourself smart how dare you write such words! The Thalis was under the Israeli flag, you fool. Most normal people would only see faces filled with sorrow and pain, you look for trouble. And the families and a nation could see that these boys died for a country they loved and believed in. The Talis was under the flag. Their love of Hashem was apparent, they were all learning in a Yeshiva. The decorum and the derech eretz that the assembled displayed was the biggest k'vod Shamayim. That even in such a sad terrible time, they all came together and were so respectful and loving to the families. 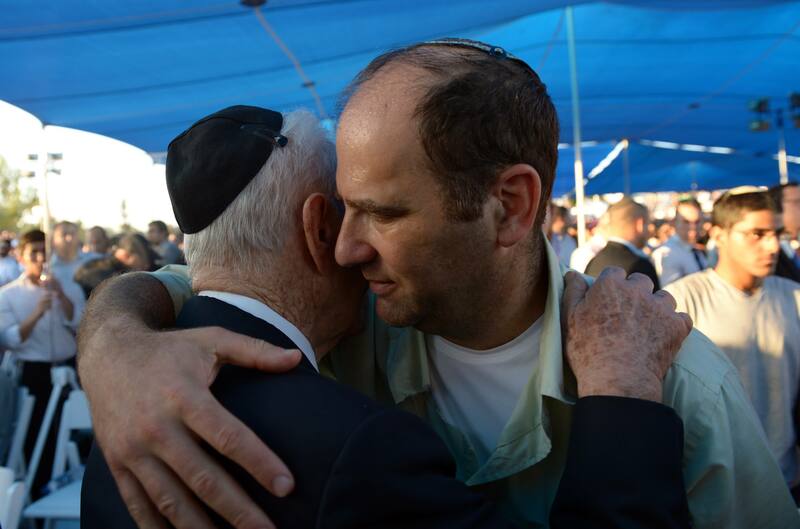 These families weren't trained for such a tragedy, yet they conducted themselves with such dignity and honor and thanked everyone who was involved in the search and bringing the boys back, even under such circumstances. How do you think this would have played out in a different country??? The flag of Israel is holy. Just like the tallis - it represents the return of the Jewish People to the country of Israel. It represents self sacrifice and love for each other. Even in a tough time like today. Disgusting comment. Don't you even know when to restrain yourself? Why how dare he? If it wasn't still going on, I might agree. Simple fact is the left-wing in the state of Israel is egging on terrorists till we're getting led off to gas chambers again. Israel can either resoundingly smash the left and stop taking everyone's crap. We will only survive by being strong and showing people we won't be walked all over anymore. No more appeasing terrorists or terrorist-supports in the west. No more talking to them at all. If they want peace it's time THEY demonstrate they want peace. We have done it ad nauseum. It's time people on the left stop acting like we don't have a right to our land. If Muslim Arabs want to share it that's fine but eventually all of this land will be ours. They've doomed themselves with this revival of kidnapping civilians. Thus far they had only snatched soldiers in the last couple decades as far as I know. Going back in history they have done this many times and we just shrugged it off. No more! We must fight back. Death to terrorist organizations. They think we have no right to exist but it is they who have no right.